Don't see quite the trip you're looking for? More or less time to spend here? Just got to visit that place you read about? Read about our custom itineraries, then contact us to plan your trip. Chiang Mai in Action Tour and Travel Services reserves the right to make small changes to itinerary schedules and arrangements. These may occur in response to unforeseen circumstances, or in order to improve the flow of your trip. We believe that Chiang Mai is a very special place indeed, and we would like to let you experience it in the best possible way. That's why we've put together the following itinerary, which has been carefully planned to ensure your comfort and enjoyment and also to be flexible to your desires. Accommodation during the tour is in hotels where we know you'll experience the warmest of Northern Thai welcomes. Your guide will be attentive to your every need, and will make sure that you take away the fondest of memories of Chiang Mai. After Breakfast, leave town for the Sanpatong District. Take an elephant ride along a trail in the forest for about 1 hour before heading to a spectacular waterfall where you can swim if you wish. Enjoy a picnic lunch together in this tranquil setting. After lunch, we'll move on to a remote Karen village. From here we'll take a bamboo raft along a particularly beautiful stretch of river passing through dense forest, and then head back into town. By now you should be ready for a Lanna style banquet, or Khan Toke dinner, in which local food is served on low wooden tables while you enjoy traditional dancing and music performed by local tribes. In the morning leave your hotel for the journey south to Doi Inthanon, Thailand's highest mountain. Travel through the luscious forest on the way up the mountain to the twin chedi dedicated to the King and Queen of Thailand. Along the way, stop off at Hmong and Karen tribal villages. We'll enjoy a picnic lunch by the spectacular Wachiratharn waterfall within Doi Inthanon National Park. Return to your hotel will be in the late afternoon. Leave your hotel at 9.00am for the 17 km journey up Suthep Mountain to the west of the city. Near the summit is the magnificent Wat Phra That Doi Suthep. This temple, one of the most important of the province, and an enduring symbol of Chiang Mai, is a place of fascinating history and legends. 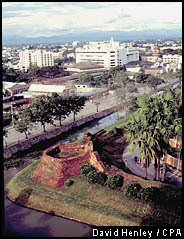 The temple grounds afford excellent views over Chiang Mai city and valley. Lunch will be taken at a real Thai restaurant, where you can sample some of the food this country is famous for. Afterwards, we'll travel to the handicraft villages of Bor Sang and Sankamphaeng to see the umbrella making center, silk, lacquerware, silverware and celadon factories. The evening has been left free for you to practise your bargaining skills at the night bazaar, and to experience a little of the city's exciting night life. Accommodation is based on twin share. The hotels are rated 4 stars with swimming pool, air-conditioning, private bathroom and toilet. We ensure that our guests get the best rooms available.